this is the one christmas present i can show you right now. 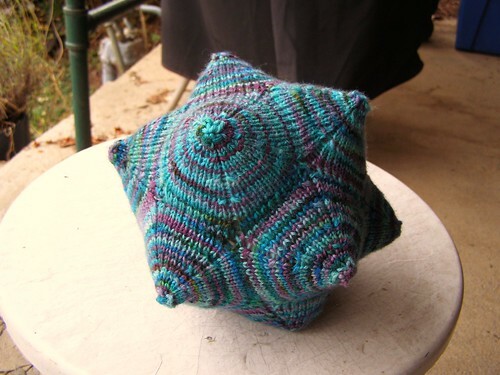 a ball for the babe using the celestine pattern by norah gaughan. raveled here. it was a fun knit and i’m thinking of making one out of handspun scraps. made with random hand dyed yarn from the stash (not mine) and stuffed with very sheepy smelling wool roving. i’ll try to get an ‘in action’ shot after christmas. merry merry to you all! and if you haven’t downloaded your free tea cosy pattern, get on that. 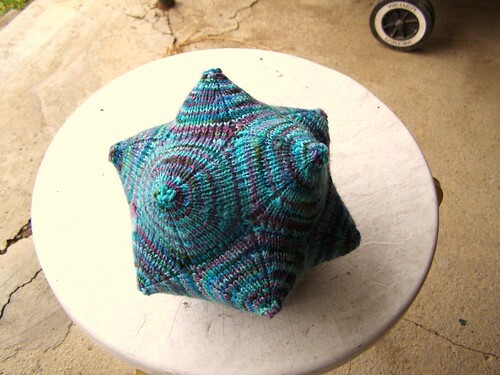 This entry was posted in baby, cosyknitsliterally, knitting, toys by cosymakes. Bookmark the permalink. That is soo beautiful! I have been thinking of making one of those too! Love the ball! Very cute!!! !